On behalf of ERCIM, the FMT Group of ISTI-CNR has participated in MODCONTROL, a subproject of the recently concluded European Integrated Project MODTRAIN. MODTRAIN stands for Innovative Modular Vehicle Concepts for an Integrated European Railway System, and was the first Integrated Project to focus on joint European railway research. The objective of MODTRAIN was to define the functional, electrical and mechanical interfaces and validation procedures for a range of interchangeable modules that will form the basis for the next generation of intercity trains and universal locomotives. MODCONTROL addressed the standardization of an innovative Train Control and Monitoring System (TCMS) designed for future interoperable European trains. Figure 1: QUARS graphical user interface. Achieving high quality in the definition of software requirements is a must in the development of reliable and dependable software products. The availability of techniques and tools for the analysis of requirement documents may help to remove inconsistencies and ambiguities at as early a stage as possible. An automatic analysis of the requirements expressed in natural language should help to guarantee the successful outcome of a project by highlighting potential sources of ambiguity and other weaknesses. In the context of MODCONTROL, we have developed the QuARS Express tool, a customized version of the QuARS tool (see ERCIM News No. 58), able to handle complex and structured data formats containing metadata and to produce an analysis report with categorized information. The new reporting feature improves on the simple text-based report provided by QuARS by exploiting HTML technology to produce structured hypertext pages. Using QuARS Express, we analysed the functional and system requirements of TCMS, which included more than 5700 requirements. The results showed that an analysis based on QuARS Express not only identifies linguistic defects, but can also provide some indication of the diverse styles used by different partners to express requirements in natural language, thus laying the basis for improvements in the formulation of requirements. Figure 2: MODCONTROL evaluation process. The project partners create a new project using IBM RequisitePro and insert the requirements with all the required attributes (Name, Text, Responsibility, Package etc). The different requirements are stored in a requirements file, one for each requirement class, ie Functional Requirements (ie, FREQ) and System Requirements (ie, SREQ). The IBM tool SoDA is used to generate a text document containing the requirements and the relevant attributes, which is saved in text format. 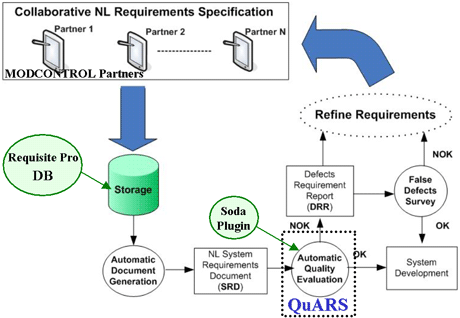 A specific template has been defined for SoDA in order to allow QuARS Express to properly interpret the information contained in the generated document. The text file obtained is input to QuARS Express, which analyses the sentences (requirements) and gives as output the Defective Requirement Reports (DRR) for both FREQ and SREQ documents, together with the calculation of relevant metrics. If QuARS Express should point to some (possible) defect, the DRR should be filtered by experts in a 'false defect survey', in order to establish whether or not a refinement is really necessary. In this case, a new cycle of quality analysis may be initiated. Otherwise, the approved requirements document is released.